The strength of equity markets is a barometer of investor confidence. The amount of capital raised through equity placement directly reflects the sentiment in the mining industry. Although 2018 is not over yet, it is a good time to take a sneak peek at the current trends in mining equity capital raisings. The following is a snapshot of the capital raised by mining and exploration companies in Q2 2018 compared to previous quarters. The data from Mining Intelligence represents companies listed on the following stock exchanges: TSX (+TSX-V), ASX, LSE (+LSE-AIM), NYSE and JSE. Only completed placement offerings were considered. Companies representing extractive and oil sands industries have been excluded from this report. The graph shows that the value of mining capital raised at major exchanges nosedived for the third consecutive quarter. In the first half of 2018, capital raised through equity placements was 18 percent lower than that in the corresponding period of 2017. In Q2 2018, the mining capital raisings value was at its lowest level in two years. The volume of transactions also decreased. While most mineral commodities markets are in a decline and struggling, one particular sector is still thriving. With the continuing buzz around green energy, electric vehicles and battery technology, the capital raised in Q2 2018 through equity placements by companies focused on lithium, cobalt and other new world critical minerals hit a record level and exceeded US$800 million. This accounted for more than 40 percent of total mining capital raised during this period at major exchanges. 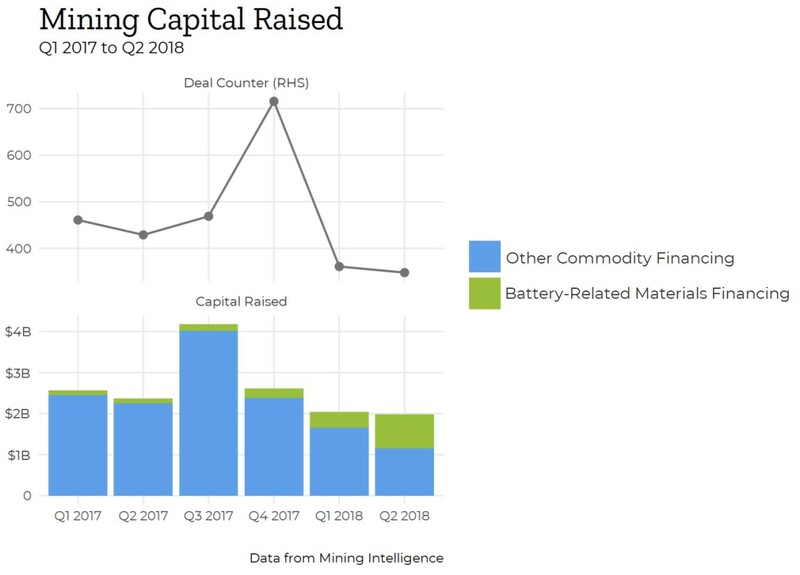 This impressive growth in the battery metals sector was mainly because of two major equity offerings completed in the second quarter of 2018. The first is unique and unprecedented for the lithium market. Nemaska Lithium’s overall C$1.1 billion (US$849 million) financing package was completed in Q2 2018. Approximately US$356 million was raised through public and private placement offerings. This comprehensive project financing package will fund the construction, commissioning, working capital and reserve funds for the Whabouchi lithium mine and the Shawinigan electrochemical plant in Canada. The second major completed equity offering was Cobalt 27 Capital’s bought deal that raised aggregated gross proceeds of approximately C$300 million (~US$225 million). The net proceeds will be used to fund Cobalt 27 Capital’s acquisition of a US$300 million cobalt stream from Vale’s Voisey’s Bay Mine, including from the proposed Voisey's Bay Mine expansion, commencing January 1, 2021. As more and more players in the mining and metals industry consider investing in the future supply of mineral commodities used in battery technology, it is likely that companies developing lithium and cobalt assets will remain the preferred targets for investors and outperform their struggling peers from other mining markets in the future.